“It was about 180 tons so the concept of bringing it out of the water at that time -- we had to have like six bulldozers, one behind the other,” director Mercedes Niess says. Niess says there are many more stories below the lake's surface that have yet to be told. Now, with the help of the federal government, she may get the chance to tell them. For the first time in 20 years, the National Oceanic and Atmospheric Administration is expanding its national marine sanctuary program. For Oswego and other communities on the Great Lakes, that designation would bring federal funding and a boost to tourism. Niess is referring to remotely operated vehicles that could show tourists the dozens of shipwrecks located within the 1,746 square miles of Lake Ontario that a local group is proposing for the sanctuary. There’s now only one freshwater marine sanctuary in the United States – it’s in Alpena, Mich., but NOAA wants to create a network along the Great Lakes, says regional director Reed Bohne. 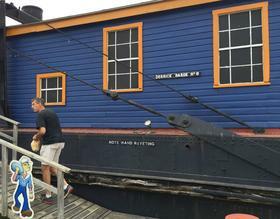 “We think that there is a continuity of history in the lakes, particularly when you look at the historic resources and shipwrecks that builds an integrated kind of story as you go from one lake to the other,” he says. There are local educational benefits as well. 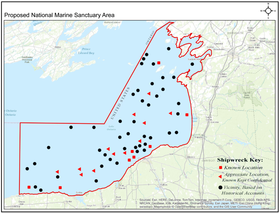 The Thunder Bay National Marine Sanctuary in Alpena has changed the area's schools. Students can learn about marine technology in primary school and earn a degree in it at the local community college. Associate Dean of Education Kristen Munger says officials at the State University of New York in Oswego are exploring similar research and educational opportunities. “There’s definitely interest about the regional effects that the lake has on us as well as that we’ve been having on the lake,” she says. Despite the enthusiasm in Oswego and other communities seeking the federal designation, there are some concerns about potential consequences. The Port of Oswego is still very active, generating more than $40 million in economic impact for the region and port director Zelko Kirincich wants to ensure the sanctuary does not restrict business. “I understand the value of preserving the shipwrecks, but they got there because they were trading commercial business, right?” Kirincich says. “We’re hoping to coexist with the project because we understand the project is a good thing." Bohne says many concerns about federal involvement and fishing restrictions are unfounded. The timeline for designating new sanctuaries is open-ended, but Bohne expects NOAA will receive about a dozen applications for the program this year.